Not sure when I'll be inspired or when I'll lack creative motivation altogether, I try to keep a box of designed-but-not-assembled jewelry pieces ready to go. I first stocked the bead box in October to keep me busy in the hospital waiting room. And, I've been re-stocking it as needed since. The last time I re-stocked the bead box was back in March (though I didn't share it until April). This was the third time I had stocked it up, and I wasn't particularly feeling inspired so I used the March Bead Challenge from Fusion Beads to help spur my designing. In this post, I'm revealing how those designs turned out in a before and after reveal. First were an "easy pair of earrings" from a textured and colored Vintaj blank and beads. Using chain as a main component was easy with this super chunky chain. I really love that the touch of color from the beads add a bit of feminity to an otherwise industrial design. Designing a set was hard for me as it's not something I usually do. While I love how well the stone beads match the enameled bead, I'm not sure how I feel about this design altogether. It feels forced and may need to transform into something else. I had to use bicone crystals for this piece, and it really worked out. I feel pretty lucky that I had just enough crystals to make these pretty earrings that are already available in the Etsy Shop. Since I don't have Super Duos (whatever those are), I used these three-hole copper beads (but just used two of their holes). I really dig the faceted Czech glass beads with the copper, but my use of wire with the components makes the whole bracelet twist and tangle on its own. I'll either have to figure out how to fix that or scrap the whole thing. I thought that learning to make a wrapped cord bracelet would be fun. However, I found myself almost instantly frustrated with the process. Honestly, I think it was the thread I was using as it kept tangling on me. When I stepped back and looked at the unfinished bracelet, I do really like it. So, it's getting added back into the next bead box to be completed when I feel up to it. The inspiration for this was to use a "flat spiral stitch". Yet, that's another skill I lack. Instead, I let myself be inspired by the word "Spiral" and chose beads with that in mind. It works! I was to fix or finish a project. 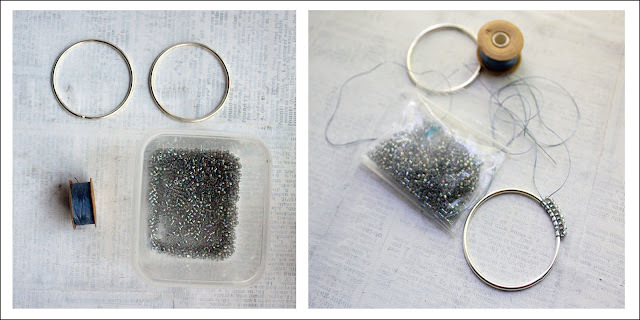 These domed tin earrings were waiting to be pulled together with jump rings. I think they're a lot of fun. You've likely already seen this necklace in my reveal for the March SJ Designs Honey Do List reveal. It's one of my favorite things to come out of this bead box! Ah, another unfinished piece. Again, it was tedious and pulled my creativity into a pit at the time. So, I stopped. But, since I still like the idea, it'll make an appearance in Bead Box 4. Here's another favorite of my finished designs. It was to feature charms. I didn't go too charm-crazy with it as the large loop is a bit heavy, and I didn't want to add too much weight. It works, and I LOVE IT! This design showcases my favorite color - that yummy peacock blue. And, there's text too! These are another favorite design to come out of the box. As for the other five designs in the box, I didn't get to them before I was heading out of town and wanted/needed to re-stock. So, they've been added along with the two tedious ones for the next box. I hope to share that with you very soon. 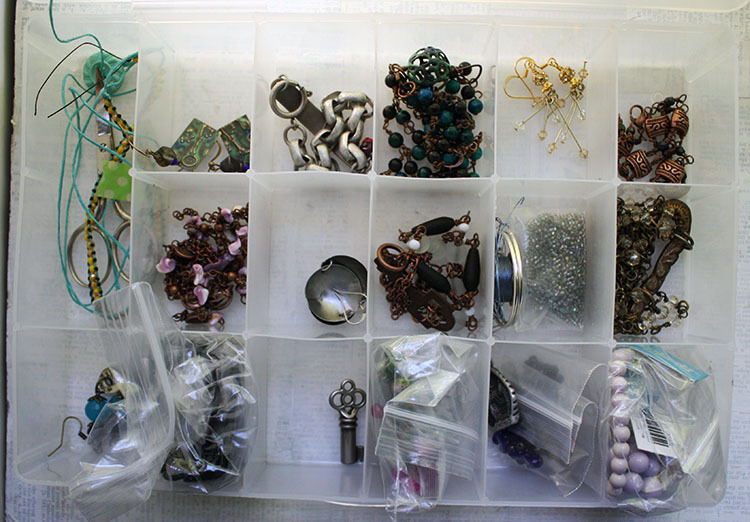 How do you keep your bead designs and ideas prepped and ready to go? Great job on everything! I especially like the "25" necklace. Great design and beads! Thank Kathy! Yeah, like I said, that's one of my favorites too. I love that rusty key! Thanks for taking the time to come by! You are way more organized than I am!!!! Bahahahaha!! I never fell very organized, you only get to see what I share. If you saw the rest of the room, you'd probably be appalled. As usual, you have presented an array of interesting projects. As somehow who makes a lot of sets, I recommend a second point of emphasis in your necklace. You could use a bead of a different shape and size (bigger) in one of the colours or a round bead in a different color as an accent in your necklace. That way your set will look coordinated and not "Matchy-matchy"
Divya, Thank you so much for your perspective and recommendation for the set. Something about it made it feel flimsy and not quite pulled together. I'll try to take a second look at it to see what I can add to make it feel a little more complete. THANK YOU! Wendy, Yes. There's something about the time it takes to complete something with bead weaving. I think I'm too much of an "instant gratification" kind of gal. But, I love the idea of the bead-weaving and actually started my jewelry-making journey with some netted necklaces. However, I just can't maintain the focus it takes. I think if I got better lighting in my living room, I might be more interested in doing these projects while watching the television. Thanks for clarifying what a Super-duo is!! Rosantia, Aw, thanks. That bracelet was such a simple project - but sometimes those are the best - not over-thought or overworked. Having projects ready to go really is comforting. Sometimes I just don't want to think about designs and just want to get busy making. That's the whole point of my bead box. It sounds like your baggie method works well for you too. Thanks for sharing!